Just two weeks after securing his second term, President Obama’s first overseas tour—to South East Asia—underscores his determination to aggressively pursue his administration’s so-called pivot to Asia. Over three days, Obama has visited Thailand, Burma (Myanmar) and Cambodia, where he will attend the East Asia Forum hosted by the Association of South East Asian Nations (ASEAN). The political and strategic significance of Obama’s trip is underscored by the fact that it is the first by a sitting American president to Burma and the first by a US president ever to Cambodia. While the timing was largely determined by the ASEAN summit, the US focus on South East Asia is part of a broader diplomatic offensive aimed at undermining China’s position throughout Asia. All three countries, especially Burma and Cambodia, have had close economic and military ties with China. Obama’s visit is aimed at consolidating US efforts to entice, pressure and bully these countries to distance themselves from Beijing and engage more closely with Washington, especially militarily. Obama’s six-hour visit to Burma yesterday was carefully calibrated to encourage the country’s military-dominated government to take further steps toward the US—all under the cynical banner of “democracy”. He deliberately did not go to the military’s new showcase capital of Naypyidaw, but met President Thein Sein and opposition leader Aung San Suu Kyi in the former capital, Rangoon (Yangon). Obama dismissed appeals not to visit Burma by various human rights organisations, which pointed to the continued detention of political prisoners and violence against Burma’s Rohingya Muslims. He declared that his trip was not an endorsement of the Burmese regime, but an acknowledgement of progress toward democracy. “I don’t think anybody’s under any illusion that Burma’s arrived, that they’re where they need to be,” he told the media. In reality, Burma’s transformation over the past year from pariah state and to “emerging democracy” has nothing to do with the regime’s very limited reforms. Despite allowing Suu Kyi and her National League for Democracy (NLD) to contest elections, the Burmese military remains firmly in control of parliament and every aspect of the state apparatus. The so-called steps that the US wants to see are close military ties and investment opportunities for American corporations. Obama’s trip has provided the essential “democratic” disguise for this shift in geo-political relations. Obama met with Suu Kyi, whose endorsement of the regime is vital to maintaining the charade of reform. He also delivered an address at the University of Rangoon, hailing the supposed steps toward democracy and encouraging other countries to make similar moves. He named North Korea, an ally of China, in particular. In discussions with Thein Sein, Obama pointed to the underlying purpose of the US rapprochement with Burma. He called for a further opening up of the country to Western investment, declaring that it could lead to “incredible development opportunities”. The US has already lifted many of its sanctions on Burma, and Obama announced the return of USAID to the country. Major US corporations, including Coca Cola and Visa, are preparing to exploit the country’s cheap labour, markets and raw materials. Late last month, a high-level American military and civilian delegation held talks with their Burmese counterparts in the capital, Naypyidaw. While nominally a “human rights dialogue,” the real aim was to resume military ties between the two countries. It is widely expected that Burma will be invited to send military observers to next year’s annual Gold Cobra war games, involving the US, Thailand and other Asian countries. The Pentagon’s engagement with Burma is one element of a broader strategy aimed at strengthening US alliances and military partnerships throughout the region. While it routinely denies a policy of encircling or containing China, the Obama administration is seeking to do just that. South East Asia is a key component. It sits astride vital sea lanes on which China relies to import energy and raw materials from the Middle East and Africa. Beijing had sought to use Burma as an alternative route by building port facilities on its Indian Ocean coast, with land transport links and pipelines through to southern China. The development of US ties with Burma threatens to cut across these plans. In a keynote speech in Singapore last Saturday, US Secretary of State Hillary Clinton indicated that Washington was encouraging Burma to act as a transport route between India, Bangladesh and South East Asia, rather than for China. Much of the agenda behind Obama’s trip to South East Asia has been implemented by Clinton and US Defence Secretary Leon Panetta. The fact that these top officials are accompanying the president highlights the importance attached by the White House to the US push into South East Asia. Obama’s visit to Thailand was largely ceremonial—a visit to the Wat Pho Royal Monastery, a courtesy meeting with King Bhumibol Adulyadej and dinner with Prime Minister Yingluck Shinawatra. Before Obama’s arrival, however, Panetta met with top Thai defence officials last Thursday, and signed a new military pact with Thailand. Panetta then visited Cambodia where he declared that the US would increase its military cooperation with South East Asian countries and participate in more and larger joint military exercises. “The United States’ rebalance to the Asia-Pacific is real, it is sustainable and it will be ongoing for a long period of time,” he said. The US “rebalance” has so far encouraged the Philippines and Vietnam to assert their territorial claims against China in the South China Sea, leading to a dangerous rise in tensions. In Cambodia, which has close ties to China, the Pentagon is already involved in counterterrorism training, provided by a US Special Forces unit, even though there are no apparent “terrorist” threats. While the training is low-key, it has enabled Washington to establish relations with Cambodian President Hun Sen’s sons—two of whom have been provided with military training in the US. 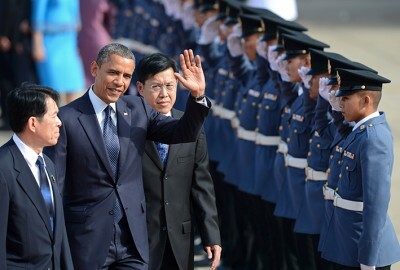 Obama is due to take part in the East Asian Summit and meet other Asian leaders today. Sharp tensions have arisen over the disputes in the South China Sea, with China seeking to keep the issue off the agenda, and the Philippines and Vietnam, joined by Japan, pushing for a formal discussion between China and ASEAN. These disagreements, which have been deliberately exacerbated by the US, underline the risk of Obama’s “pivot” leading to conflict and war.